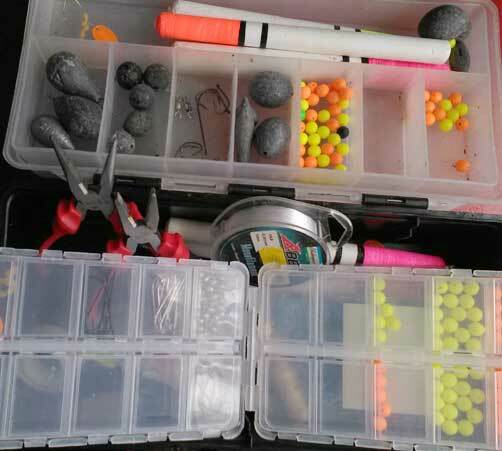 What should go inside my fishing tackle box for shore and sea fishing. In the image above you'll see that two swivels are being used. One to connect to your main line and the other as part of the pulley rig. 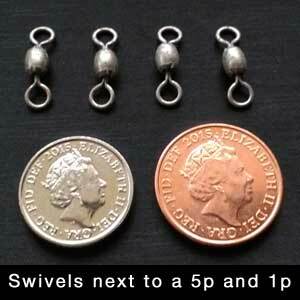 Having a packet of small and medium sized swivels in your box is highly recommended! Okay… I will admit it… Yes I have arrived at my fishing spot, got all set-up and then suddenly realised my lovely fresh live crab or live worms are sat at home with their feet up, watching TV and being very thankful I forgot to take them! I've seen seagulls swoop and grab bait before, I've seen dogs run off with it. Anything can happen! Even if you're not that into feathering they are worth having as a back-up in case something goes wrong. Feathers come in packets with 3 to 6 feathers. If you only use light gear don't get the packets with more than 3 feathers. If you're on a good beachcaster and strong reel having 6 feathers on your line will be fine. 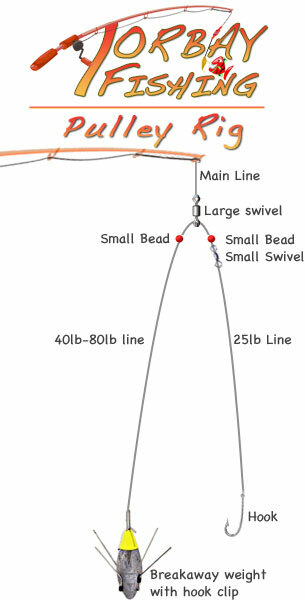 If you want more information about feathering please click this feathering for mackerel link. There are lots of choices out there and which ones you use comes down to your own personal preferences. 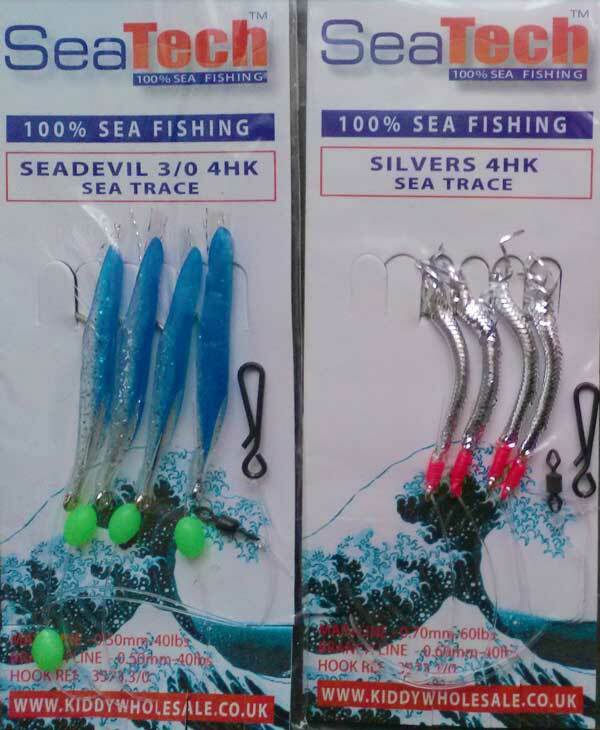 Personally, I like using circle hooks for float fishing as they do tend to keep the fish hooked once they bite. 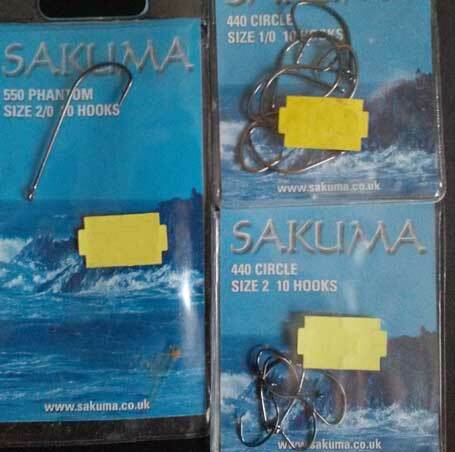 For longer baits likes worms and sand eels you'll need a longer shank, like the left packet in the image above. How many types you use is down to you. For the fishing I do, the packets in the image above are what I mostly take with me. 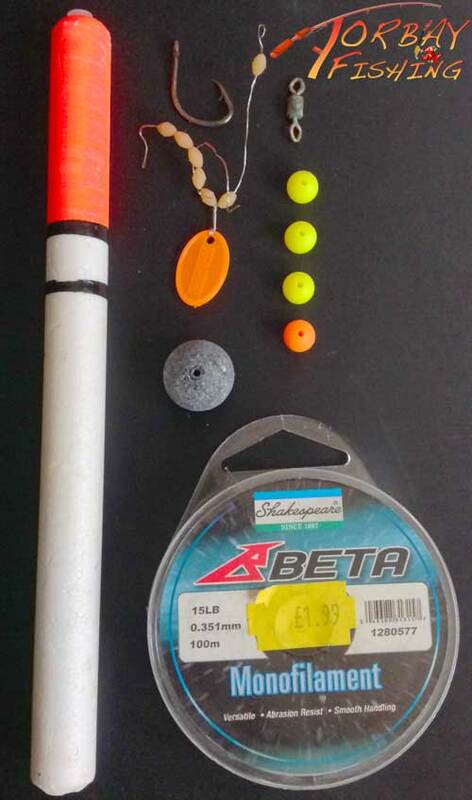 For more information on making a float fishing set-up please see this 'Float fishing rig guide' page.